This yarn had been calling my name for months, it is so soft. I love the color and it is 100% organic, making it environmentally friendly. So I decided to use it to knit a summer sweater for Knitty. 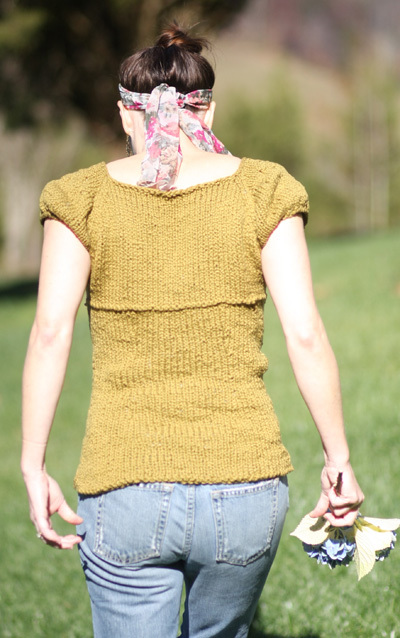 I first thought I would do a cabled tee sweater; however, after knitting with the yarn I found I really like simple stockinette stitch the best. I added some eyelet yarn overs and gathers for decoration and a purl ridge to separate the fitted body. I love the square neckline. The cap sleeves and gathers harken back to the Jane Austen era. This sweater is knit from the top down all in one piece. This means no seams to sew and you can try it on as you knit, making it easy to fit you perfectly. Also the length can easily be adjusted accordingly. It is mostly knit stitch and has minimal finishing making it a quick project. You can get off the needles and onto your body in time to enjoy the fresh spring breezes! Using shorter circular needle, CO 64[68, 76, 84, 88, 96, 96] sts. Place marker and join to begin working in the round, being careful not to twist (use unique marker to indicate beginning of round). As you work bodice/yoke, switch to longer circular needle when needed. Set-up Round: P1, place marker, p10[10, 12, 12, 12, 14, 14], place marker, p1, place marker, p20[22, 24, 28, 30, 32, 32], place marker, p1, place marker, p10[10, 12, 12, 12, 14, 14], place marker, p1, place marker, p20[22, 24, 28, 30, 32, 32]. Raglan Increase Round: [K1, slip marker, RLI, k to 1 st before next marker, RLI, k1, slip marker] four times. 8 sts increased. Repeat these 2 rounds three times more. 96[100, 108, 116, 120, 128, 128] sts: 18[18, 20, 20, 20, 22, 22] sts for each sleeve and 28[30, 32, 36, 38, 40, 40] sts each for front and back (not including single sts between markers). First Eyelet Round: K1, slip marker, RLI, k1[1, 2, 2, 2, 1, 1], [yo, k4] 4[4, 4, 4, 4, 5, 5] times, yo, k0[0, 1, 1, 1, 0, 0], RLI, k1, slip marker, k1, slip marker; RLI, k to 1 st before next marker, RLI, k1, slip marker, k1, slip marker; RLI, k1[1, 2, 2, 2, 1, 1], [yo, k4] 4[4, 4, 4, 4, 5, 5] times, yo, k0[0, 1, 1, 1, 0, 0], RLI, k1, slip marker, k1, slip marker; RLI, k2[3, 4, 2, 3, 4, 4], [yo, k4] 6[6, 6, 8, 8, 8, 8] times, yo, k1[2, 3, 1, 2, 3, 3], RLI, k1. 121[125, 133, 143, 147, 157, 157] sts: 25[25, 27, 27, 27, 30, 30] sts for each sleeve, 30[32, 34, 38, 40, 42, 42] sts for back, and 37[39, 41, 47, 49, 51, 51] sts for front. Work Raglan Increase Round. 129[133, 141, 151, 155, 165, 165] sts. Second Eyelet Round: K1, slip marker, RLI, k1[1, 2, 2, 2, 1, 1], [yo, k5] 5[5, 5, 5, 5, 6, 6] times, yo, k0[0, 1, 1, 1, 0, 0], RLI, k1, slip marker, k1, slip marker; RLI, k to 1 st before next marker, RLI, k1, slip marker, k1, slip marker; RLI, k1[1, 2, 2, 2, 1, 1], [yo, k5] 5[5, 5, 5, 5, 6, 6] times, yo, k0[0, 1, 1, 1, 0, 0], RLI, k1, slip marker, k1, slip marker; RLI, k2[3, 4, 2, 3, 4, 4], [yo, k5] 7[7, 7, 9, 9, 9, 9] times, yo, k1[2, 3, 1, 2, 3, 3], RLI, k1. 157[161, 169, 181, 185, 197, 197] sts: 35[35, 37, 37, 37, 41, 41] sts for each sleeve, 34[36, 38, 42, 44, 46, 46] sts for back, and 49[51, 53, 61, 63, 65, 65] sts for front. Repeat these 2 rounds 4[5, 7, 8, 9, 10, 11] times more. 197[209, 233, 253, 265, 285, 293] sts: 45[47, 53, 55, 57, 63, 65] sts for each sleeve, 59[63, 69, 79, 83, 87, 89] sts for front, and 44[48, 54, 60, 64, 68, 70] sts for back. K 1 round. Work measures approx. 6[6.5, 7.5, 8, 8.5, 9, 9.5] inches at center back. Yarn will now be positioned at end of sts for front. Do not break yarn. Sleeves will be worked using a new ball of yarn, then lower body will be worked using ball of yarn currently attached to sts of front. CO 3 sts onto one double-point needle. Continuing from these sts and using double-point needles, k first 47[49, 55, 57, 59, 65, 67] sts from circular needle (all sts of one sleeve, and single stitch between markers before and after sleeve sts), removing markers. 50[52, 58, 60, 62, 68, 70] sts on double-point needles. Join to work in the round. Round 1: K to last st; k last st of round together with first st of next round. 49[51, 57, 59, 61, 67, 69] sts. Round 2: [K1, k2tog] 16[17, 19, 19, 20, 22, 23] times, k1[0, 0, 2, 1, 1, 0]. 33[34, 38, 40, 41, 45, 46] sts. Slip next 44[48, 54, 60, 64, 68, 70] sts from circular needle (all sts of back) to shorter circular needle. Work as for left sleeve. Round 1: Using longer circular needle and yarn attached to sts of front, pick up and k 3 sts in CO sts at left underarm, placing marker after second picked-up st (use unique marker to indicate beginning of round); k all sts of back, pick up and k 3 sts in CO sts at right underarm, placing marker after second picked-up st; k sts of front to 3 sts before left underarm marker, ssk, k1. 108[116, 128, 144, 152, 160, 164] sts. Round 2: [K2tog, k to 3 sts before marker, ssk, k1, slip marker] twice. 104[112, 124, 140, 148, 156, 160] sts. Round 3: K2tog, k to 3 sts before marker, ssk, k1, slip marker, k2tog, k to end. 101[109, 121, 137, 145, 153, 157] sts: 58[62, 68, 78, 82, 86, 88] sts for front, 43[47, 53, 59, 63, 67, 69] sts for back. Work in stockinette st until work measures 2 inches from underarm. Note: This point is lower edge of bodice. Before working next round, it is a good idea to slip sts to waste yarn and try on sweater, to ensure that bodice is long enough to cover bust vertically. If needed, work more length at this point. Next Round: K to marker, remove marker, k5[5, 6, 9, 9, 19, 32], (ssk) 12[13, 14, 15, 16, 12, 6] times, (k2tog) 12[13, 14, 15, 16, 12, 6] times, k5[5, 6, 9, 9, 19, 32]. 77[83, 93, 107, 113, 129, 145] sts. Do not remove end-of-round marker. Set-up Round: K14[15, 17, 20, 21, 23, 24], place marker, k13[17, 19, 21, 21, 21, 21], place marker, k26[27, 30, 35, 38, 44, 50], place marker, k12[12, 14, 16, 16, 20, 24], place marker, k12[12, 13, 15, 17, 21, 26]. First two markers (not incl. end-of-round marker) indicate decrease/increase points for back, last two markers indicate decrease/increase points for front. First Decrease Round: K to 2 sts before first marker, ssk, slip marker, k to second marker, slip marker, k2tog, k to end. 75[81, 91, 105, 111, 127, 143] sts. Note: As written, lower body will measure approx. 14 inches from lower edge of bodice. If you have lengthened bodice, you may wish to work fewer rounds between decrease/increase rounds. Second Decrease Round: [K to 2 sts before first marker, ssk, slip marker, k to next marker, slip marker, k2tog] twice, k to end. 71[77, 87, 101, 107, 123, 139] sts. Repeat Second Decrease Round. 67[73, 83, 97, 103, 119, 135] sts. Increase Round: [K to 1 st before marker, RLI, k1, slip marker, k to next marker, slip marker, RLI] twice, k to end. 71[77, 87, 101, 107, 123, 139] sts. Repeat these 7 rounds once more, then work Increase Round once more. 79[85, 95, 109, 115, 131, 147] sts. 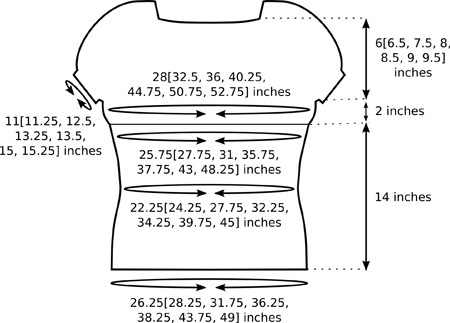 K 12 rounds, or until garment is desired length. P 1 round. BO all sts purlwise. Weave ends. Blocking is not neccessary if using recommended yarn. Machine wash gentle, partially machine dry on low heat setting. Lay flat to finish drying. 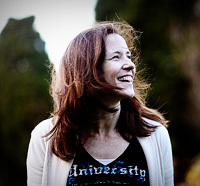 Jennifer Wood designs for Wood House Knits. She taught herself to knit 10 years ago and loved it so much she began designing her own patterns. It has been wonderful outlet for her creative energy. She has an absolutely wonderful husband, three amazing children, a fine son-in-law, and two bad dogs. 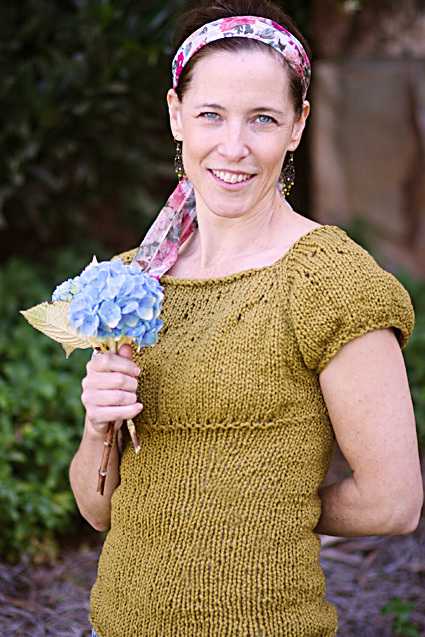 Recently, she began selling her patterns through her business Wood House Knits. 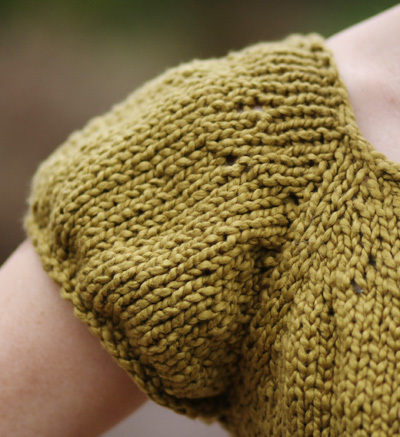 Her patterns can be found on her website and through Etsy and on Ravelry as woodhouseknits.